Achieve smooth and youthful lips with the By Terry Hyaluronic Sheer Rouge Hydra-Balm Lipstick; a 2-in-1 product that functions as a volumising balm, as well as lip colour. 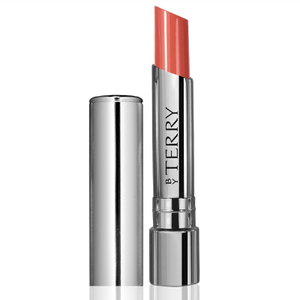 The lipstick effortlessly glides across lips, instantly melting into skin and delivering an essential veil of moisture. Enriched with a healthy dose of Hyaluronic Acid, the hydrating lipstick is able to reduce the appearance of fine lines and wrinkles, whilst smoothing and plumping the pout for a healthy-looking, volumised finish. Complete with ‘Crystal-Colour’ micro-pigments, the lipstick offers pure, intense colour that leaves lips full and defined. Apply directly to lips using the stick or a lip brush. Pentaerythrityl Tetraisostearate, Isostearyl Isostearate, Diisostearyl Malate, Polybutene, Octyldodecanol, Ethylhexyl Methoxycinnamate, Polyethylene, PVP/Hexadecene Copolymer, VP/Hexadecene Copolymer, Mica, Candelilla Cera/Euphorbia Cerifera (Candelilla) Wax, Silica, Butyl Methoxydibenzoylmethane, Cera Microcristallina/Microcrystalline Wax/Cire microcristalline, Ozokerite, Fragrance / Parfum, Aroma/Flavor, Phenoxyethanol, Tocopheryl Acetate, Alpha-Isomethylionone, Lecithin, Citronellol, Geraniol, Tocopherol, Ascorbyl Palmitate, Citric Acid, Tin Oxide, May Contain (+/-):, CI 77891/Titanium Dioxide, CI 45410/Red 28, CI 77492/Iron Oxides, CI 77491/Iron Oxides, CI 15850/Red 7 Lake, CI 15850/Red 6, CI 15985 (Yellow 6 Lake), CI 77499/Iron Oxides, CI 42090/Blue 1 Lake, CI 75470 (Carmine).